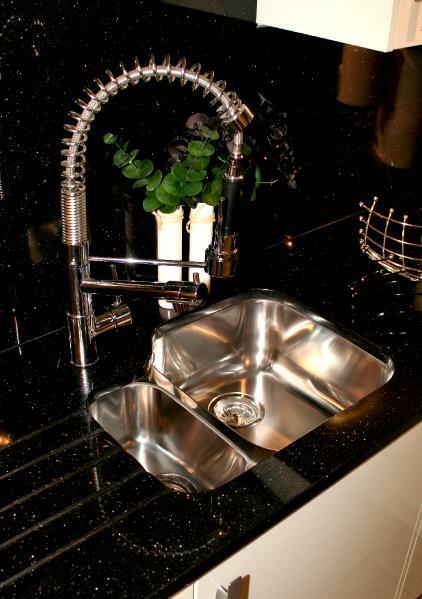 Stainless steel, ceramic, granite... flush, inset, proud... single, double... the permations are endless. Let your imagination run free, then tell us what you want. Choose from all the top brands of kitchen appliances for the fitted kitchen of your dreams. Gas or electric cookers and hobs, Range cookers, steam ovens, wine coolers, warming drawers, coffee makers, corner fridges, waste disposal, intergrated washer/dryers, hi-tec ovens, dishwashers, extractors... the list is endless to make your kitchen unique and your cooking a joy. Why not call us today for a free quotation or to arrange a home visit. Crown, imperial, sheraton, prentice, miele, neff, kitchen aid, electrolux, whirpool, elica, gorente, gutman, corian, glass, stainless steel, zodiac, ceaserstone, granite, maia, encore, wood, hertfordshire, herts, stevenage, Kitchens, appliances, sinks, cookers, hobs, fridges, range cookers, worktops, work surfaces, kitchen design, fitting, supply.